Sterling Presbyterian Manor will hold its annual Art is Ageless® reception on April 5, 2019, from 1:30 – 2:30 p.m. Entries of artists works are from area artists who are 65 years or older. Fort Scott Village will hold its annual Art is Ageless® reception on April 5, 2019, at 3:30 p.m., Dining Room. Entries of artists works are from area artists who are 65 years or older. Parsons Presbyterian Manor will hold its annual Art is Ageless® reception on April 11, 2019, at 6:30 p.m., Jesse Gehman Chapel. Entries of artists works are from area artists who are 65 years or older. Arkansas City Presbyterian Manor will hold its annual Art is Ageless® reception on April 12, 2019, at 2 p.m., Clubroom. Entries of artists works are from area artists who are 65 years or older. 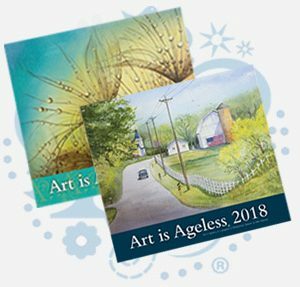 Aberdeen Village will hold its annual Art is Ageless® reception on April 26, 2019, at 3:00 p.m. Entries of artists works are from area artists who are 65 years or older.